During the Muslim holiday Eid al-Adha, 385 Muslim children hear a greater story of sacrifice. It’s not everyday that nearly 400 kids crowd around a WorldVenture missionary’s house. But that’s exactly what happened yesterday at the kickoff of the Muslim holiday Eid al-Adha, or Tabaski, as it’s called in most of West Africa. 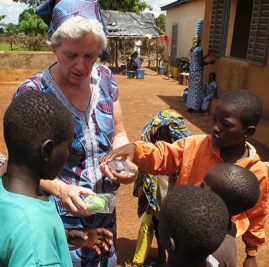 385 children went to the home of Thomas and Laura Requadt, WorldVenture missionaries in Fourou, Mali, where a ministry partner talked to them about Jesus. Tabaski marks the end of the Hajj, the Muslim pilgrimage to Mecca. Muslims around the world observe the four-day holiday as a time to honor Abraham’s willingness to sacrifice his son in the Old Testament. And for missionaries like Laura, it can also be a time to engage their Muslim neighbors with the truth concerning Christ’s sacrifice. I recently sat down with Laura to hear more about the past 10 years she has spent with Malian children, offering them cookies and the opportunity to learn—and even memorize—the Bible. These kids understand the need for sacrifice. The kids who are from animistic and Muslim families do a lot of sacrifices to get the higher beings to be happy with them and make life work right. I work really hard at pointing out that Jesus is the sacrifice that God says he accepts. They also see things that we as Westerners don’t understand, such as the story of Joseph. Most of these kids have multiple moms and siblings from different parents, so sibling rivalry is huge. A dad liking one wife more than the other: they understand these things. It resonates with them. Even though Joseph was wrong for disrespecting his brothers, you don’t sell your brother. Family is everything. They really understand some Bible stories better than Americans do. They’ve seen demon possession or they’ve definitely heard of it, so when Jesus is casting out demons, it really resonates with them.